The AT&T SHAPE Technology and Entertainment Expo was held at the Warner Brothers studios July 14-15 in Burbank, California. 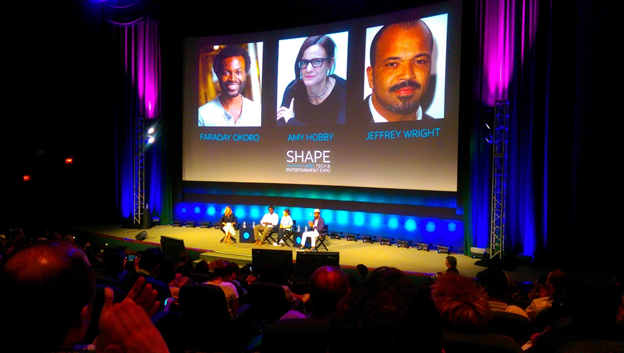 The SHAPE event was quite different from previous AT&T events, primarily because of the strong focus on Hollywood and the entertainment industry. Actually being ‘on location’ on the Warner Brothers lot drove this point home very effectively. However, the format for the event was familiar, in that it consisted of roughly one-hour sessions which were delivered in one of the Warner Brothers screening theaters. Approximately 10,000 people attended the event. The main theater where the sessions were hosted had more than 500 seats, with an overflow theater and live streaming of the main stage displayed on TV monitors in other locations throughout the Warner Brothers studio lot. From a high level, AT&T SHAPE conveyed, without a doubt, that AT&T is moving full force into the media and entertainment business. The DIRECTV acquisition in 2015 was a critically important step towards this goal, as it provided AT&T with a strong point of entry into the media/entertainment world, superseding its comparatively small U-verse pay-TV presence. AT&T’s subsequent launch of its DIRECTV NOW over-the-top (OTT) video platform has garnered more than 500,000 subscribers to date (through Q2 2017). And just prior to the SHAPE event, AT&T launched the beta testing of its next-generation, cloud-based video platform. These developments highlight AT&T’s plans to leverage its DIRECTV branding and pay-TV subscriber base to transform itself into a market leader in the rapidly evolving and increasingly non-linear, OTT-based pay-TV market. AT&T will also collect data on media consumption patterns through the new platform, in order to personalize content and advertising, thereby further monetizing services and content. To this end, AT&T will leverage its multi-faceted connectivity capabilities, both wireline and wireless, to deliver content/media and tailored advertising to its customers. During the course of the SHAPE event, the sessions provided additional glimpses into the Time Warner assets that AT&T will take ownership of, if not directly influence. The session topics included Internet of Things (IoT) and interactive cinema, virtual and augmented reality (VR and AR), direct-to-consumer technology and social media, and the influence of technology on sports. Other sessions covered animation, evolving ‘next-generation’ advertising models, and the DC Comics universe. Just to clarify, the DC Comics content portfolio consists of the blockbuster and perpetually regenerating movie franchises, more than a dozen TV shows, the comic book assets, and the massive gaming market. To illustrate the gaming opportunity, it’s a $100 billion dollar market, with DC Comics-based games reaching 100 million gamers worldwide. In terms of insights from the SHAPE event, again, the most striking is AT&T’s clear intent to transform the company from ‘the Phone Company’ of the 20th century into a 21st century media and entertainment juggernaut, which also just happens to have a very strong legacy in networking. In fact, AT&T’s corporate organization will have two fronts: 1) the Entertainment group, based in El Segundo (and Burbank/Hollywood), California; and 2) the Networks group, based in Dallas, Texas. AT&T also asserted quite clearly that the Time Warner studios will continue to have creative independence following the close of the acquisition. As we have seen with the DIRECTV acquisition, AT&T has been quite savvy in how it is leveraging its new content assets, as well as the evolving distribution models for that content. We should expect the same strategy following the close of the Time Warner deal. This corporate expansion and transformation will be critically important to AT&T as it faces comparable strategic moves from key rivals, most prominently, Comcast. Throw in the fact that AT&T can combine (and deliver) its evolving media/entertainment/content assets with both its wireline ultra-broadband services and its wireless service, and AT&T appears to be extremely well poised to address and shape both the entertainment and networking future. Consolidate content and distribution assets for additional cost and operational savings.